A stunning pair of sterling silver earrings.inlaid with Moonstone. Stone(s):Moonstone. Lock Type: Hook. Material: Sterling Silver (92.5% silver content). Stamp: 925. A stunning pair of sterling silver earrings inlaid with Moonstone. Stone(s):Moonstone. Lock Type: Hook. Material: Sterling Silver (92.5% silver content). Category: Earrings. 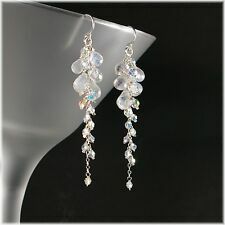 Beautiful stunners, these are incredibly beautiful sparkly earrings. Sterling silver chains adorned with different shapes and sizes of rainbow moonstone briolettes and white freshwater pearls. Length: 3” long. Illuminate your look with a long line of shine. Clustered Rainbow Moonstone briolettes and Austrian crystals send off sparks of light with every step you take. Gorgeous, light-grabbing rainbow moonstones (9x5mm) and crystals (4mm) form a dainty chain, designed to catch the light with every gesture. 925 solid silver Natural Rainbow Moonstone Designer gifted Dangles Earrings 1"
A stunning pair of sterling silver earrings.inlaid with Moonstone. Stone(s): Moonstone. Lock Type: Hook. Material: Genuine Sterling Silver (92.5% silver content). Stamp: 925. Category: Earrings. Diamond Clasp and Lock. Fusion Gold Earrings. Sapphire Jewelry. Designer Gemstone Earrings. Victorian Earrings. Natural Ruby Jewelry. Pave Diamond Jewelry. Diamond Charms. STERLING SILVER MOONSTONE OVAL SHAPE DANGLE FILIGREE EARRINGS. THEY ARE STAMPED "925". We specialize in ONE OF THE KIND. We silver jewelry world have largest collection of pure sterling 92.5 silver Jewelry. we are sterling silver jewelry manufacturer and exporter from Jaipur Rajasthan. Rajasthan is one of India's richest states having many dynasty, palaces, music, food ,culture. 2 round 4.10 mm ± moonstone. 8 oval 6 x 4 mm ± moonstone. chandelier / girandole style. bezel setting. Handmade Solid Sterling Silver Earrings. natural untreated. Moonstone Natural 13mm x 18mm Oval Gemstone with Silver Brass Ball Spacer Earrings. 925 Sterling Silver hooks & pins. Sweet sophistication abounds with these Rainbow Moonstone chain dangle earrings! 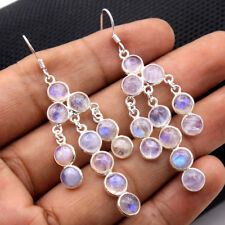 Three vibrant pear-shaped rainbow moonstone briolettes (6x7mm) dangle gracefully on delicate sterling silver chains. The colorless, with a blue sheen and a rainbow-like array of colors rainbow stones allow this piece to be worn with any colored attire, these fabulous earrings are sure to get you noticed. Rainbow Moonstone & 925 Sterling Silver. Rainbow Moonstone intensifies your Goddess Energy, they have a highly spiritual nature. Beautiful Abalone Shell Purple Heart Handmade 925 Bali Design Sterling Silver Hook Earring (#301605559324). Loose Bead. Natural Freshwater Pearl. 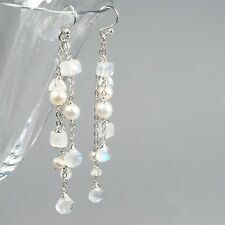 Christmas Special Natural Moonstone Long Dangle Earring 925 Silver Jewelry 2.7"
Ring Bracelet Necklace Pendant Earrings. we silver jewelry world have largest collection of pure sterling 92.5 silver Jewelry. we are sterling silver jewelry manufacturer and exporter from Jaipur Rajasthan. Pave Diamond Bangle. Polki Diamond Bangle. Diamond Wedding Bangle. Diamond Clasp and Lock. Rose Cut Diamond Bead. Pave Diamond Bead Ball. Wide Cuff Bangle. Handmade Gold Silver Jewelry. 2 oval 6 x 4 mm moonstone. 4 round 3.00 mm moonstone. bezel setting. Handmade Solid Sterling Silver Earrings. natural untreated. 925 Sterling silver Natural Orthoclase Moonstone Fine jewelry Drop Earring 1"
We are biggest wholesaler and exporter of solid 925 sterling silver gemstone jewelry since 2008. Not below. and each pieces is stamped 925. and almost gemstone is natural. Each piece is stamped 925. Pave Diamond Bangle. Polki Diamond Bangle. Diamond Wedding Bangle. Diamond Clasp and Lock. Rose Cut Diamond Bead. Wide Cuff Bangle. Pave Diamond Bead Ball. Fusion Gold Earrings. Indian Ethnic Necklace. Pave Diamond Bangle. Polki Diamond Bangle. Diamond Wedding Bangle. Diamond Clasp and Lock. Rose Cut Diamond Bead. Pave Diamond Bead Ball. Wide Cuff Bangle. Labradorite & 925 Sterling Silver. Labradorite is. Beautiful Abalone Shell Purple Heart Handmade 925 Bali Design Sterling Silver Hook Earring (#301605559324). Beautiful earrings! AMAZING 1 3/4" Filigree SOLID 925 Sterling Silver with Abalone Hoop Earrings (#301567011985). We have a huge collection of all type of sterling silver jewelry be it with Gemstones, Oxidized or with Diamonds. We believe that our prices are the best out there. The prices differ because of the quality, clarity of the stones used in the jewelry, setting of stones etc. SOLID 925 SILVER CAB RAINBOW MOONSTONE WOMENS ETERNITY WEAR DROP EARRING 1.2"
Natural Moonstone Handmade Dangle Earring 925 Sterling Silver Jewelry 1.3"
Item Type : Rainbow Moonstone Earrings. Gemstone : Rainbow Moonstone. Moonstone White 18 x 25mm Faceted Oval Gemstone Sterling Silver Earrings 1 3/4"